It's one of those summer desserts that you just keep picking at. And because it's got fruit and oats in it, you can totally say it's on the good for you side of desserts... although with the amount of sugar.. Maybe don't think about that part! 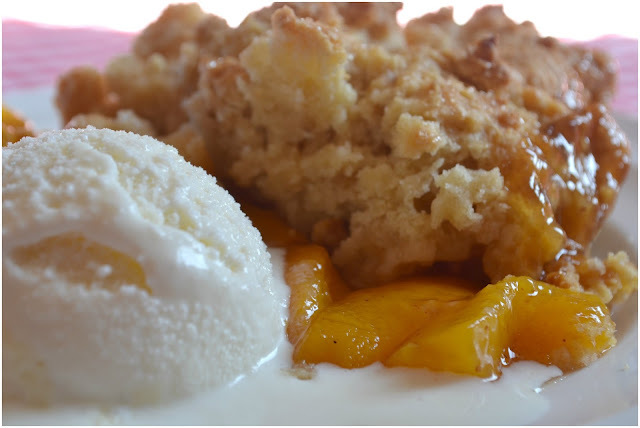 It's one of those desserts that is really great warm with real vanilla ice-cream, melting in to the crevasses, dripping down the sides of the peaches. Served at room temperature with a dollop of fresh cream and some grated nutmeg. Or how about cold from the fridge, straight off the spoon, as you stare pointlessly into the shelves trying to come up with something for dinner that isn't Peach Cobbler!! 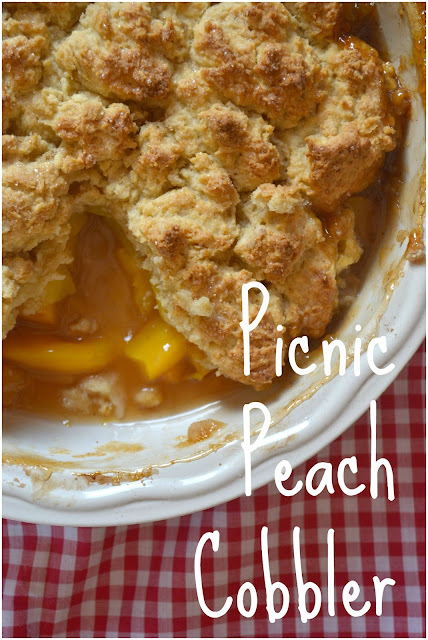 It a robust, sturdy bake to bring with you to that summer picnic you've been invited to. 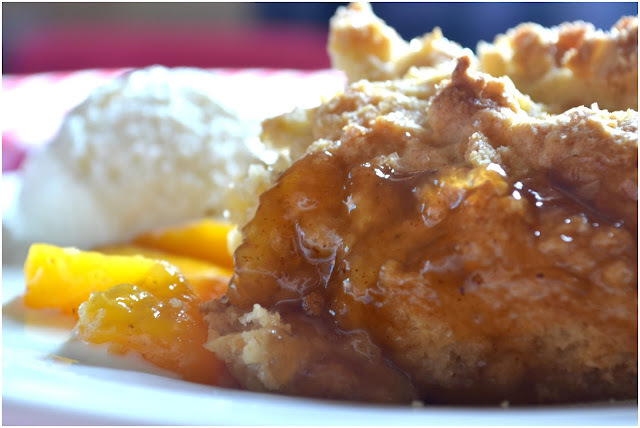 Imagine the applause as you roll up with this dish, filled with sweet juicy peaches, topped with soft oaty-baked cobbler and a tub of vanilla bean ice cream. It's not that hard to make either. You kind of just dump the peaches in the dish, throw over some sugar and spices. 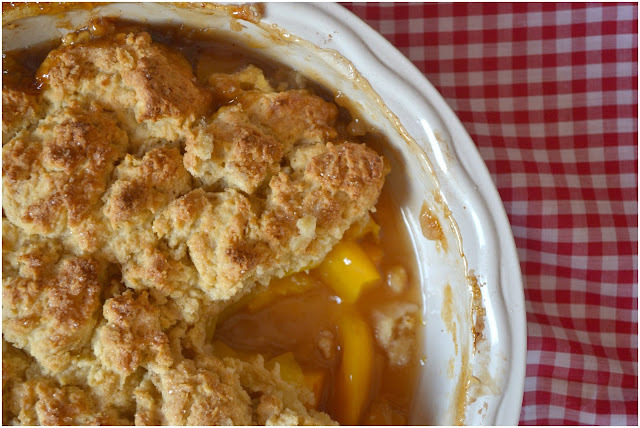 Leave to sit, make the cobbler, bake for 50 minutes and wait for it to cool... To be honest the hardest part is waiting for it to cook and then cool. Because believe me when I say it comes out hot. Like very hot and you will burn your tongue... so just wait a bit longer. Combine your peaches (with the canned version, drain them completely first), lemon juice, sugar, cinnamon, nutmeg, salt and cornflour in a large bowl; mix them all up real good and set aside for 10-15 minutes. I got so excited to bake it, I forgot to take a picture of it! Whisk together the flours, oats, baking powder, sugar in a mixing bowl. Throw the butter pieces into the bowl and with your fingers, work them into the flour mixture until it is the texture of breadcrumbs. It can be a chunky as you like here. Pour the buttermilk on top and using a fork, mix until just combined. It'll be nice and sticky. Pour the peach sugar/spice concoction into a deep baking dish, (mines a ten inch apple pie dish with 3 inch deep sides). 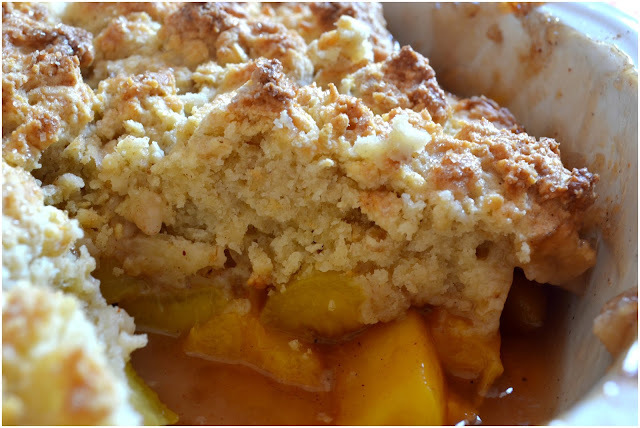 Drop the cobbler topping dough by the spoonful all over the peach filling. 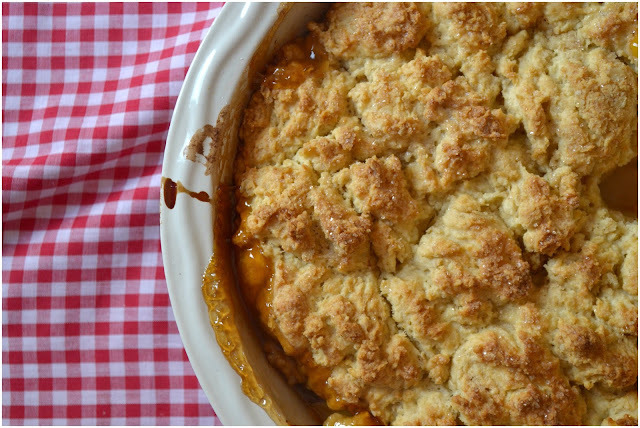 There's no exact way of doing this, just cover the whole thing leaving tiny gaps to let all those yummy juices bubble up and spill out over the cobbler crumb! 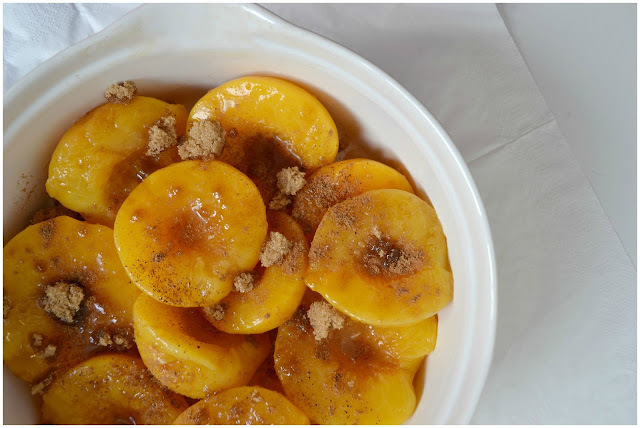 Bake for 50 to 60 minutes, or until the fruit is bubbling and the topping is golden brown. Leave to cool on a wire rack when it comes out. The juices are very hot so please be careful. I know it'll be hard to wait but I promise it'll be worth it. I like mine served warm with vanilla ice cream.. the real bean kind. Not the soft serve I have in the pictures!! Seems my kids have taken a liking to the real kind too... The apple doesn't fall far, eh? Enjoy the week folks and as always, thank you so much for stopping by! Can I come to your picnic please! That looks absolutely delicious! Definitely dish me up a big bowl with some great ice cream. The wait is the hardest part, especially after you smell it bake for all of that time!